Receive your new Fluke tool ready to go to work, out of the box with a traceable calibration certificate. If you work in an ISO 9000, FDA regulated, government contracting, or one of the many other companies that require traceability in measurement processes, let us help you save time. Order your new Fluke Digital Multimeter, ScopeMeter® Test Tool, Power Quality Analyzer, or other Fluke tool with the calibration you need for your work place. 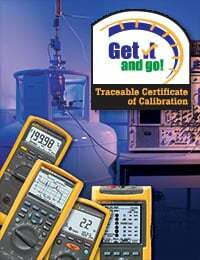 Don't waste time sending your new instrument out for a calibration certificate after it arrives, order the type of calibration you need now so when it arrives you are ready to go! Most Fluke tools receive a "Statement of Calibration Practices". This indicates that Fluke Corporation has certified the product calibrated with validated calibration procedures during the manufacturing process. This also indicates that the measurement standards and instruments used during the calibration of the product are traceable to SI units through internationally recognized measurement standards. Fluke’s measurement standards are calibrated by comparison to higher level standards at planned intervals. These Statements however are not recognized as a formal calibration certificate and do not reference your products serial number, date, or model number. Your company may require a specific certificate type to meet your own quality standards. The item numbers in the above table remain the same for any product you purchase and identify that particular calibration. The pricing on the calibration varies with the model you purchase. It doesn't matter if you purchase a DMM or a Power Quality Analyzer, the item number for the calibration remains the same. The pricing changes with the product and complexity of its calibration. When ordering from your preferred distributor, provide the product model number as well as the calibration certificate item number. View a detailed listing of available calibration certificates (.pdf) by model and available accredited calibrations.